Here is a simple, easy-to-assemble meal to make for yourself or for a crowd. Plan on serving a half breast per person if you have a lot of side dishes or a full breast per person for a hungry crowd. Even chefs have a tendency to undercook duck breasts. I find that duck breast is a little like hangar steak, in that it is not necessarily something you want to eat rare because it gets too chewy. Aim for a nice medium to medium-rare. Nailing this preparation is an easy way to surprise and impress your guests. The technique involves slowly rendering out the fat to get beautifully crispy skin, then finishing the breasts in the oven, though not for too long. It’s better to pull out the breasts early and let them rest for a long time, so the meat takes on that gorgeous ruby hue and remains juicy throughout. While the duck is cold, pull off the tenders (the loose flap of meat on the underside of the breast) and reserve for another use. Score the skin on each breast in a ¼-inch crosshatch pattern, cutting only through the skin and avoiding the flesh (see photo). Place the scored breasts on a plate and let them come to room temperature, about 1 hour. Season each breast with about ½ teaspoon salt and ⅛ teaspoon pepper on the skin side and about half that much salt and pepper on the meat side. The exact amount of seasoning will depend on the size of the breasts, but season aggressively, rubbing in the salt and pepper with your fingers since much of the salt will come off during searing. Place a baking sheet in the oven and preheat the oven to 400°F. Heat a black steel pan over medium-high heat until hot but not smoking, about 1 minute. Place 2 breasts, skin side down, in the pan. Turn down the heat to medium-low and, using tongs, move the breasts around and press down frequently (keeping the skin side down) to ensure even coloring across the skin until the fat is rendered, 5 to 6 minutes. The heat must be kept medium-low to ensure that the fat renders slowly and completely and that the skin doesn’t burn. If the fat on a duck breast is rendered properly, the skin will be fully crisp. Transfer the breasts to a plate, discard the fat in the pan, and repeat with the remaining 2 breasts. Once all of the breasts are on the plate, wipe out the pan. To finish cooking the duck, heat 1 tablespoon of the oil in the same pan over high heat until rippling but not smoking. Add 2 breasts, skin side down as before, and sear for 15 seconds, then flip the breasts onto the meat side. Immediately place 3 tablespoons of the butter and about one-third of the thyme sprigs in the pan and, as the butter melts, repeatedly spoon it over the breasts to baste the meat. Transfer the breasts and thyme to a baking sheet. Pour the butter and juices over the meat. Repeat with the remaining 1 tablespoon oil, 2 breasts, and 3 tablespoons butter and with another one-third of the thyme sprigs. Carefully remove the hot baking sheet from the oven, place the 4 breasts skin side up on it, and pour over the butter and juices. Return the baking sheet to the oven and roast until the thickest part of the breast reaches an internal temperature of 107°F to 110°F, 3 to 5 minutes. Keep a close eye on each breast and remove each one as soon as it reaches temperature; the timing may vary depending on the size. To test for doneness without a thermometer, flip a breast meat side up. Firmly press the thickest part of the breast with your index and middle fingers; the meat should bounce back ever so slightly. If it’s hard, the breast is overcooked; if there’s no bounce at all and the meat feels squishy, it’s too rare. Spread the remaining thyme sprigs on a large plate or in a shallow baking dish. Place the breasts skin side up on top of the thyme and pour over any butter and juices. Tent loosely with aluminum foil and let rest for 15 minutes. Discard the thyme. Slice each breast on the bias (across the grain, with your knife at a 45-degree angle) into ¼-inch pieces. 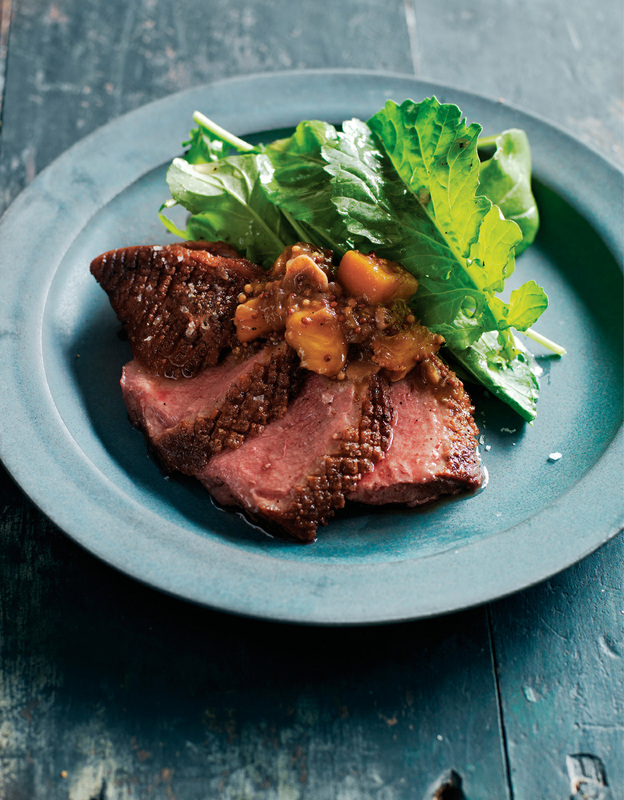 To serve with arugula dressed with Caramelized Honey–Black Pepper Vinaigrette and Peach Confiture as shown (see photo), arrange the duck slices on individual plates, top each portion with a tablespoon of the confiture, and nestle a small tuft of dressed arugula on the side. Duck is rich and needs to be served with something bright and palate cleansing; the sweet fruit of the peaches plays off the slightly gamey meat beautifully.